On May 5, 2017, Mars passes solar longitude 0 as the Sun crosses the equator on Mars. This is the vernal equinox, and was chosen by planetary scientists as the start of a new year (A Mars year is 687 Earth days). This is year 34 on Mars. This animation shows that a year on Mars is almost twice as long as a year on Earth. Because Mars is farther away from the sun, it has to travel a greater distance around the sun. 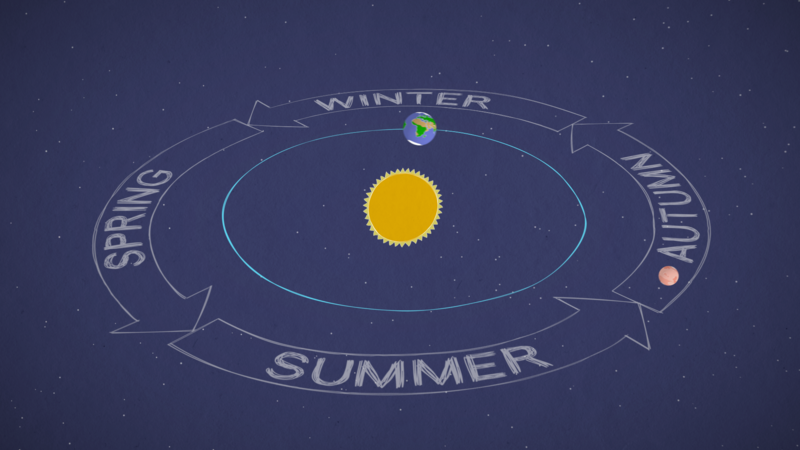 It takes Mars about twice as long as it does for Earth to make one circle around the sun. Therefore, a year on Mars lasts twice as long. Did you know that there's a U.S. city named Mars? Mars, Pennsylvania hosts an annual Mars New Year celebration and NASA is participating in this two-day science, technology, engineering and math (STEM) event to inspire young people to pursue innovation and exploration. Check out the image gallery below from the Mars New Year celebration in 2017. Check out the image gallery below from the Mars New Year celebration in 2015.